These days, home financing options are plenty. Good credit or bad, you have many choices when it comes to purchasing a home. These days, home financing options are plenty. Good credit or bad, you have many choices when it comes to purchasing a home. One option that doesn’t get a lot of attention is renting-to-own. Rent-to-own is also known as a lease purchase. It’s a contract between you and the seller which sets a closing date at a future, mutually agreed upon closing date. Often, the closing date is set sometime between one and three years in the future. The buyer and seller create a contract that specifies a purchase price for the home at market value, or even a little higher, to allow for anticipated increases in market value. It’s obviously to the buyer’s benefit if the agreed purchase price reflects current market value. Any increase in the home’s value at the time of closing goes to the buyer, making this home financing option a nice bonus to buyers. As a buyer, you will sign a traditional lease and pay monthly rent to the homeowner, who is essentially your landlord. With this structure, you can move into your home right away. With a lease option agreement, a percentage of your monthly rent will go toward the purchase price of your home. You will also pay an option fee as a percentage of the value of your home. The option fee also goes toward the purchase price of your home. You should understand that typical rent-to-own agreements specify that you will lose any monies paid toward the purchase price of the home if for any reason you do not eventually buy it. You are also responsible for home maintenance and upkeep while you live in the home. If your credit is less than perfect, the big benefit of renting-to-own home financing is that don’t have to depend on a bank to get into a home of your own. You also have one to three years to improve your credit so that you can obtain a mortgage or other funds with which to purchase your home. Additionally a rent-to-own program allows you to build sweat equity in your home. You’re responsible for the upkeep of your home, so any improvements or modifications you make improve the equity in the home that you’re purchasing. Another perk is locking in a purchase price. No matter how much you improve the value of the home, the seller will honor the original purchase price, so you will reap the benefit of owning a more valuable home. Forfeiting Money. If for any reason you fail to obtain either a mortgage or the funds to purchase the property at the end of the lease agreement, you will lose any money and time you invested in the home. You Don’t Officially Own the Home. The seller could stop paying mortgage payments or taxes and end up with liens on the home. This means that you could potentially lose the investment you’ve made in the home. Late Payments. You must be diligent in paying your landlord on time every month. In traditional lease agreements, you could lose your security deposit if you’re late on your rent. With a rent-to-own home financing option, you stand to lose the money you’ve invested in the home, plus any equity that you build while you’re there. Falling Property Value. You might not be able to re-negotiate the selling price of the home if the real estate market falls. There’s a lot to consider when renting-to-own. You will need to research the contract to ensure that you understand the purchase price, the option fees and rent payments, and potential default if either party breaches the lease terms. Depending on your financial situation, the benefits may far outweigh the cons. A lease agreement gives you time to repair and rebuild your credit so that you can obtain an affordable mortgage. 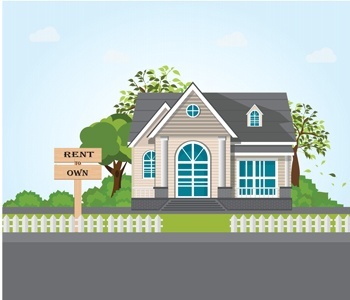 Rent-to-own options are relatively scarce, but you can check with your local real estate agent to find sellers who may be willing to consider a lease agreement. Buyers and sellers can both benefit from rent-to-own sales. As with any major financial transaction, it’s essential that both parties understand the details the agreement. Check with your attorney to ensure you understand the legalities of rent-to-own.